As a child, the owner spent many memorable days and nights in a tree house erected by his grandfather. In homage to these memories, he wanted to build a live-in tree house. We often say that the only thing you can grow well here are rocks; befittingly, we could not find a single tree suitable for a tree house on the 57 acre site. In response, we proposed a house among the trees - a structure that would soar through the trees, carving the sky. As the late-afternoon November sun fell across the textured bark of the trunks of hickories and oaks, it articulated the hollowed and raised spaces between the bark’s ridges. 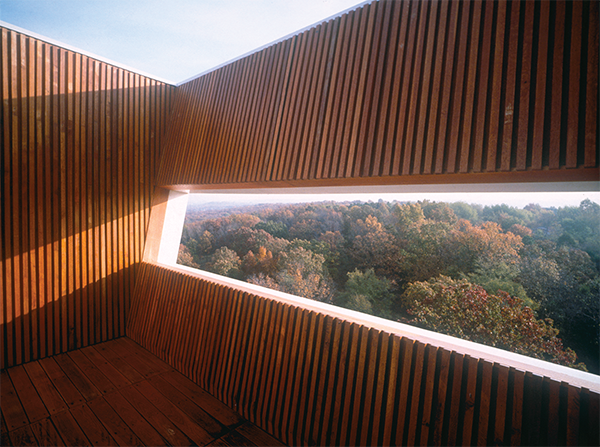 This observation inspired the design of a wooden lattice, made of white-oak fins, which filters and reflects light and establishes a visible datum at the height of the tree canopy. Approached frontally, the lattice appears transparent and displaces weight to the metal skin above. 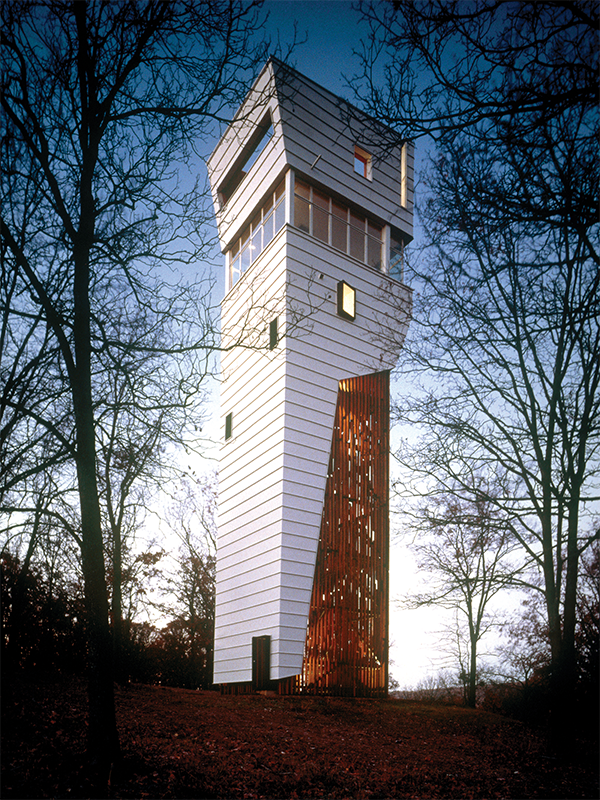 As you circle it, the voids between the oak fins perceptually collapse, providing a sense of gravity that “grounds” the tower. 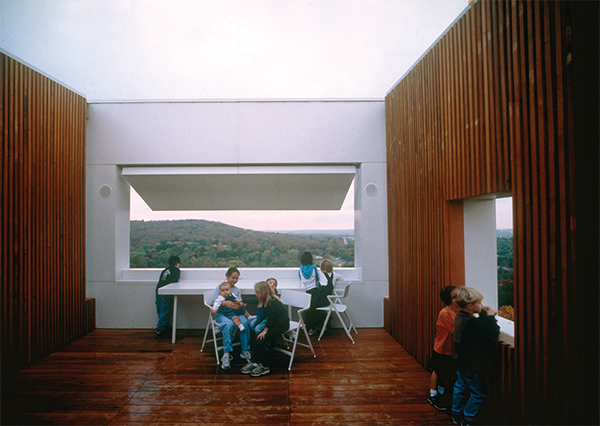 This organic condition contrasts the white cladding of horizontal standing-seam steel panels that enclose the east elevation and the upper program elements. 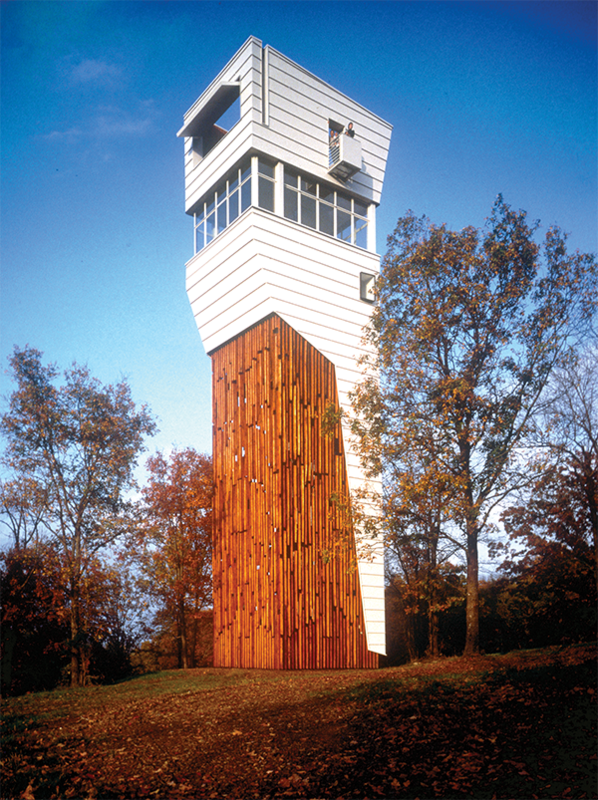 This material tactic references the predominantly white-metal-clad industrial and agricultural structures that pierce the tree canopy in the landscape beyond. Here, the structure takes its place within an existing “other” order seldom seen, or understood, from the ground. Local creek and river stones comprise the ground surface at the tower’s base. Inside the skin—the husk—of the building, an acoustical transition is made in the stairwell court as footsteps fall onto the floor covered with crushed pecan shells. 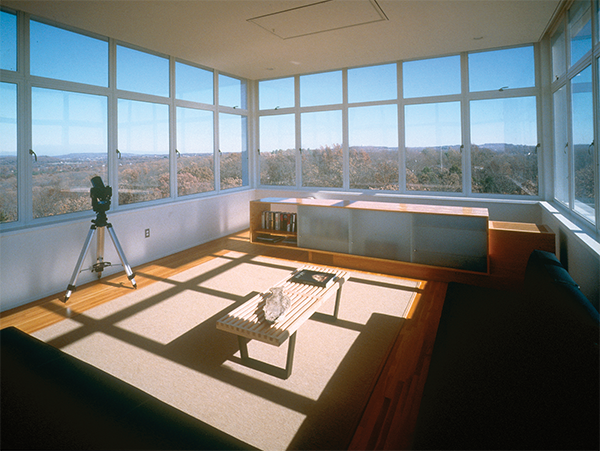 The program for living is simple—an interior room for viewing the expansive horizon in all directions and an open-roof exterior room that frames the sky above and the land below. One is invited to feel the breeze, stargaze, anticipate the passing of clouds above, or sleep out under the night sky.